Opportunities to buy food directly from farmers, in urban and rural areas, have increased considerably in recent years. 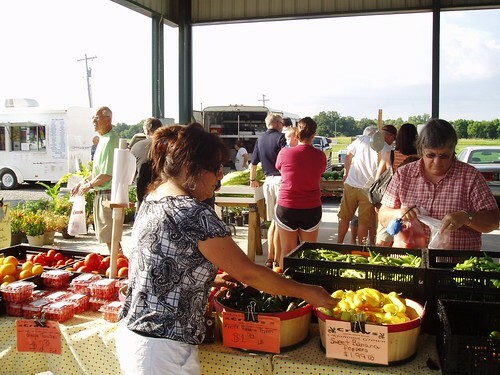 The number of farms that sold food at roadside stands, farmers’ markets, pick-your-own farms, onfarm stores, and community-supported agricultural arrangements increased 24 percent between 2002 and 2012. 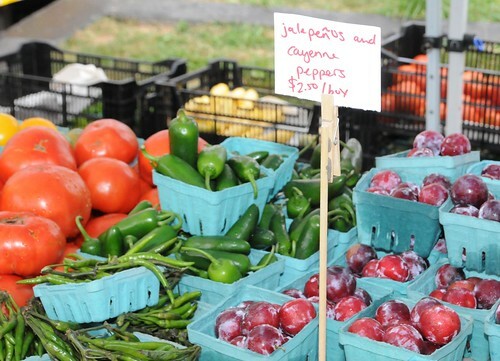 Economists at the Economic Research Service (ERS) have found that farmers who market goods directly to consumers are more likely to remain in business than those who market only through traditional channels. Farmers face many business risks, including fluctuations in prices and yields. ERS looked at Census of Agriculture data showing that 61 percent of farms with direct-to-consumer (DTC) sales in 2007 were in business under the same operator in 2012, compared with 55 percent of farms without DTC sales. In a comparison of farms across four size categories (defined by annual sales in 2007), farmers with DTC sales had a higher survival rate in each category. The difference in survival rates ranged from 10 percentage points among the smallest farms to about 6 percentage points among the largest. What is it about DTC marketing that seems to enhance farmers’ chances of remaining in business? One advantage may stem from the fact that farms using DTC marketing may be less capital-intensive operations. The Census data show that farms with direct sales required less machinery and land to achieve a certain level of sales. Moreover, these farms had lower debt levels than similarly sized farms with no direct sales. A more secure income stream may also help account for some of the difference in survival rates. Income of DTC farms comes from both production and marketing. The portion from DTC marketing depends on the margin between the wholesale and retail price. Even when farmers’ input and output prices vary, the markup between the wholesale and retail prices tends to be relatively stable. Hence, the additional income that farmers can earn by selling directly to consumers rather than to wholesalers should not vary substantially because of farm price fluctuations, making their farm income less risky. While selling directly to consumers might offer advantages to farmers that help them remain in businesses in a risky and competitive environment, the data also show that the surviving farmers tend to grow their businesses at a slower rate than farms with no DTC marketing. In a recent article in our online magazine, Amber Waves, and in a report on trends in local and regional food systems, ERS offers some possible explanations of this finding as well as further discussion of DTC and farm business survival. 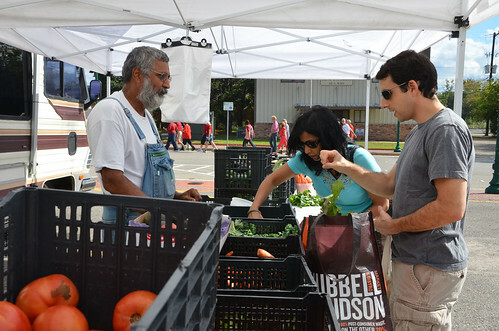 Farmers’ market in Texas. USDA photo. this sounds interesting will expand our DTC as a strategy for survival that is interesting indeed! Thanks for sharing. Rural farmers have the most risks.However, in generality of agricultural business risks vary from; Location to location, time to time, Skill to management, organization to infrastructures and then marketing plus interveners between producers and consumers,the factors which farmers near cities eliminate. Many small farmers have to do it to get the added value to their products. A big operation have a lot of expenses, government requirements. Small farmer can produce little and loose little. The advantage to the farmers market specially organics is that you can relate with the producer and is a direct relation. The problems of organics crops are the high costs of certification and the difficulty of preserve that product for more days. I love Farmers Markets specially for fruits and vegetables. As a farmer I se the love and effort of my colluegues..we share a solidary economy. It is really good to know about the farms that directly sell to consumers. Thanks for sharing this article. THAT' S GOOD NEWS TO HEAR!!! I HOPE THAT IT STAYS THAT WAY!! !